Denise E. Agosto, PhD, is professor in the College of Computing & Informatics and director of the Master's in Library & Information Science program at Drexel University. Denise E. Agosto, Editor. Information Literacy and Libraries in the Age of Fake News. Libraries Unlimited, 2018. ABC-CLIO, publisher.abc-clio.com/9781440864193. 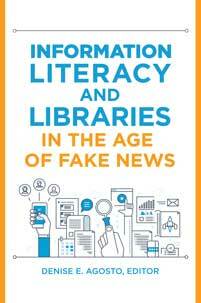 Going beyond the fake news problem, this book tackles the broader issue of teaching library users of all types how to become more critical consumers and sharers of information.